Plantar means “bottom of the foot.” The plantar fascia is the long, strong band of connective tissue that runs along the sole of your foot. Its thick central part, the plantar aponeurosis, is bound by thinner lateral portions. This is the part of the foot that protects the sole from injury and supports and stabilizes the arch (with the help of the posterior tibial tendon). 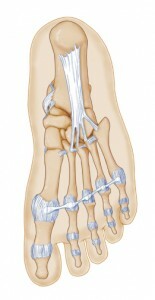 The plantar fascia originates on the bottom of the heel bone and extends toward the base of the toes. It is the part of the foot that allows your foot to stretch and recoil as you take each step. Complications can arise with the plantar fascia, especially for people who spend a lot of time running or jumping. Athletes are a great example. For instance, in early October 2010, Al Harrington of the Denver Nuggets tore his plantar fascia. The injury sidelined him for several weeks. The plantar fascia is a complex structure that extends from the medial calcaneal tubercle (the heel bone) to the proximal phalanges of the toes (the bone at the base of the toe) at the metatarsophalangeal (MTP) joints. As it progresses from the heel bone to the toes, it breaks into five sections, each extending into a toe and straddling the flexor tendons. Within the structure, there are three distinct components: the medial, central, and lateral components, with the central being the most prominent of the three. The plantar fascia is directly connected to the Achilles tendon in younger people. When we are young, our Achilles tendons continue through the calcaneal tubercle (heel bone), which is the origin of the plantar fascia. As we age, the connection dissolves. By the time we are elderly, there may only be a few connecting fibers left between the two. Aggravation of the plantar fascia can be a chronic condition, and it can lead to additional complications such as plantar fasciitis. Symptoms of an injured plantar fascia include inflammation and pain. The most common cause of injury to the plantar fascia is overuse and strain. Strains can be caused by weight gain or by wearing worn-out shoes. Always wear proper-fitting footwear for exercise, sports, and work. Do stretching exercises for the Achilles tendon (the tendon that extends from heel to calf). When starting a new sport or exercise, start slowly, increasing your pace over the course of weeks or months. Limit your activities when an injury has occurred. Elevate and ice your feet if they are sore or tired. Practice good hygiene, especially with your feet. Maintain your proper weight; obesity can put additional stress on your feet. If you have injured or ruptured your plantar fascia, there are many treatment options available. The most common conservative method for treating a tear or complication is RICE—Rest, Ice, Compression and Elevation. Treatment may vary depending upon the cause of injury. In most cases, your podiatrist will want you to start with plenty of rest, followed by gentle stretching exercises. Anti-inflammatory medications may also be helpful if the plantar fascia is injured. Some patients find that taping the arch of the foot provides stability and relief from pain. Severe ruptures and tears may require a cortisone injection to allow the healing process to go smoothly.